Stimeyland: He’s Right Behind Me, Isn’t He? 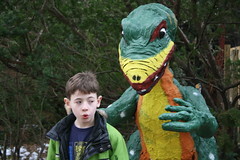 I’m writing about Team Stimey’s Stupendously Fabulous Spring Break Adventure right now, but I’m not going to finish it in time to publish it tonight, so I thought I might tide you over with this most excellent photo that Sam snapped of Jack at Dinosaurland on Tuesday. In fact, I almost feel like this calls for a caption contest. Anyone?